Perhaps the most important thing you can do to prepare for your new life in Mexico is to join online expat forums—before you leave the U.S. That way you begin to integrate into your new community overseas. Facebook, for example, has many expat groups designed for people who live in a particular city or area. My wife, Diane and I did this. We built relationships with quite a few expats already living in the community we had selected. From them, we learned a ton of information about the area, assisting us in making our choice. When we landed at the airport in our new country, our online friends were waiting for us, holding signs and balloons. They had arranged for our first, very affordable apartment, furnished and completely outfitted for immediate occupancy. It was two-bedrooms, two bathrooms, with a terrace that overlooked the ocean. Back then, the cost for all that was just $450 per month. And we already had a social network and available assistance when needed. Not all those relationships stuck, but some did. And it was an important aspect to our initial success living there. Today’s rental and real estate prices in Cancun and along the Riviera Maya (80 miles of perfect beach stretching south from Cancun, through Puerto Morelos, Playa del Carmen, Akumal and Tulum) continue to reflect the popularity of this area as a tourist Mecca, as well as a growing expat destination. Investors seeking an overseas income property, might want to consider this area as over 5 million tourists spend their hard-earned money here each year. Naturally, beachfront properties are the most desirable for vacation rentals and the most expensive to purchase. They also demand the highest short-term rental rates with units going from $135 to $325 nightly, depending on size, location, and amenities. As beachfront properties, and even those properties located close to the beach, are always in high demand, and as available land is extremely limited, nearly all suitable residential properties are in high-rise or low-rise condo buildings. Purchase prices may run in the low to mid $100,000 range for a small unit of 600 to 650 square feet. Larger units with two and three bedrooms can run from $225,000 up to several million dollars for luxury units. 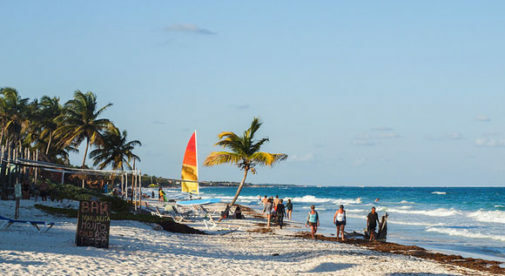 As a renter along the Riviera Maya, the challenge is to find a property that is available for the long-term, as short-term rentals generate significant revenue for the owners. Those seeking a long-term rental must be diligent and quick to respond to opportunities. Finally, do not rely on the internet to locate properties. Only a very small percentage of available properties show up on the web. The most common way that properties are advertised in Mexico is by placing a sign in a window or taped to a door. We found our current property by walking through various condo complexes and jotting down phone numbers of properties for sale and rent. Our current, multi-level beachfront condo in Cancun was advertised for sale but we negotiated a long-term rental contract. This definitely put a smile on my face.